The earthly life of Gene Edward Newman perished on Monday, 18 June 2018. He was born in Oklahoma City on 20 November 1928 as the first of three sons of Raymond Wilber "Buck" and Bessie Loraine (Hopewell) Newman. Except for a short period, he was a life long resident of the City and experienced over three-quarters of the State history at his passing. Gene was active in the Boy Scouts of America and achieved Eagle Scout status. 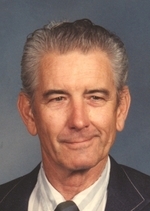 He attended his sophomore year of high school at the Oklahoma Military Academy in Claremore and graduated from Putnam City High School in 1947, where he lettered in football and track. He also completed one year of higher education at Oklahoma A&M College in Stillwater. Gene served in the United States Navy from 1952 to 1954 when he was medically discharged following an off-duty accident involving his legs, which he fully recovered from and was not hindered by in later life. He served as a Boiler Operator on the USS Benewah (APB 35) in the Atlantic, being stationed out of Newport, Rhode Island. He married Virginia Ann Harding on 10 September 1955 and remained married for 59 years until her passing. He was the father of one daughter, Kathy Ann (Newman) Schreiber, and one son, Brett Alan Newman, and raised and guided them to adulthood, an accomplishment he was very proud of. Gene was employed by Oklahoma Gas & Electric Company for 39 years from 1948 to 1987, serving as a Plant Operator in the Belle Isle and Mustang Power Plants. He was a lifelong member of the Church of God including Capitol Hill Church, Shartel Church, Belle Isle Community Church, and Crossings Community Church. Gene was an outstanding Son, Brother, Husband, Father, Grandfather, Great-Grandfather, and most of all "Good ol' Boy". He was very sociable and comfortable around people he knew well and people who were total strangers, having inherited that trait from his mother Bessie. He enjoyed conversation with a rural country style that was warm and friendly, with ample use of old-school speak such as "meanwhile, back at the ranch" and similar Okie phraseology. He also exhibited a deep sense of humor and playfulness, and used that as his favorite mechanism to interact with family and friends, and to overcome life's trials and struggles. Yet, he could be very serious and focused, especially when working on projects and passions. These opposing traits of humor and seriousness were inherited from his father "Buck". Gene had a wide spectrum of interests and pursuits including firearms, hunting, mechanics, motorsports, bicycles-motorcycles-automobiles, country music, puzzles, coin-rock collecting, purple martin and pigeon enthusiast, wood crafter, guitar picker, and gardener. Using his favorite descriptor of other accomplished and respected individuals, he could be described as a "crackerjack" gunner and gunsmith, waterfowl shooter, mechanical analyzer-fabricator, and Indianapolis Motor Speedway race fanatic. One of his proudest accomplishments was the restoration of his father's 1926 Harley-Davidson race motorcycle, #7, which is displayed in the Oklahoma History Center. These interests founded a strong heritage between himself and his brothers Ray and Johnny. Gene had great love for family pets, especially dogs including Jessie, Rue, Froofie, Ralph, and Brownie. He also enjoyed an uncountable number of road trips for family vacation, camping, sight seeing, and just to get away, all across this great land of ours. He put up a valiant and courageous fight against advancing age and clung to his independence for all but the last three of his 89 plus years. While he labored in his declining body during his last years, he now enjoys a new fresh body to begin his heavenly life. Although he was missed immediately upon passing, from his loving friendship and guidance for family and friends, he has provided a great anchor and inheritance to move forward with in his absence. Gene is survived by daughter Kathy Ann (Russell) Schreiber, son Brett Alan (Amanda) Newman; granddaughter Courtney Marie (Maz) Ameli, granddaughter Leah Elaine (Alex) Schreiber, grandson Joseph James Schreiber; great-granddaughter Adelae Elaine Ameli and great-grandson Caspian Warren Omid Ameli. Services to honor & celebrate Gene’s life will be held at 10:00 A.M, Saturday, June 23, 2018 in the Rose Hill Mausoleum Chapel 6001 N. Grand Blvd OKC. In lieu of flowers memorials may be made to Frontier Hospice, 221 N. I-35 Service Rd. Suite D, Moore, OK, 73160. To send flowers to the family of Gene Newman, please visit our Heartfelt Sympathies Store.